Last year, my friend Jason got me into Australian rules football. Jay is not big on sports; he once asked a Miami Dolphins fan if they wore teal and orange because they were losing. However there was something about the game, which was as rough as American football, but with less safety equipment and more punting, that intrigued both Jason and myself. The fact that longtime Philadelphia Eagles and Washington Redskins punter, Sav Rocca, was one of the best Australian rules players of the 1990’s, further piqued my interest. 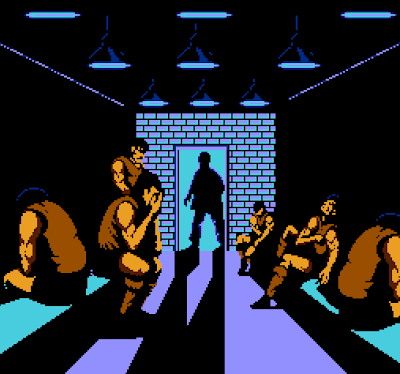 Just how interested was I in footy, and what does it have to do with the cool early-90's NES graphics above? Find out after the jump! Jay went on to follow Collingwood, Australia’s answer to the Dallas Cowboys, and the expansion Gold Coast Suns, which was their answer to the 1962 Mets. Meanwhile, I would root for whoever would make the game interesting, so if Essendon was to upset eventual Grand Final champion Geelong, like they did in one of the first regular season games I watched, I’d go for the Bombers over the Cats. If an upstart like Gold Coast threatened to beat a crappy established team like Richmond, then Go Suns. And if Hawthorn scored 197 points to Port Adelaide’s 32 (which happened in Round 21 last year) you kinda wished they went for just one more goal. 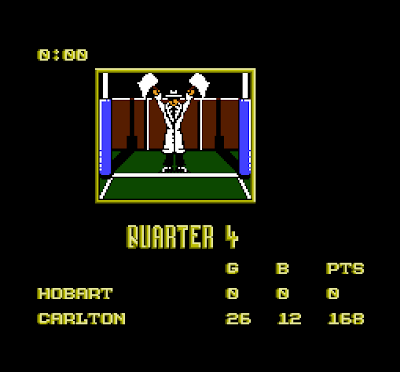 Eventually, my infatuation with early 1990's sports video games (especially Tecmo Super Bowl and the game's legendary rendition of Bo Jackson) combined with my newfound love of Australian rules football. 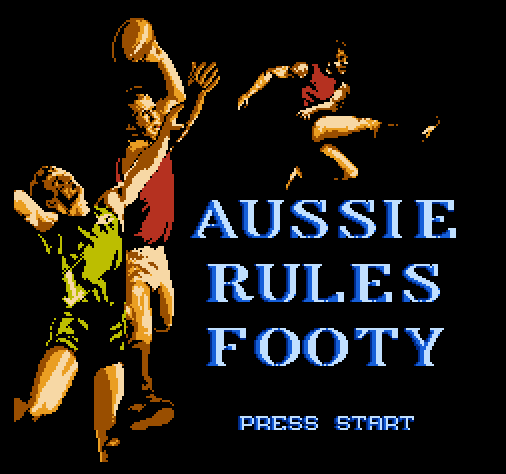 Aussie Rules Football is a 1991 video game that is as legendary in its early video game portrayal of the AFL as Tecmo Super Bowl is for the early 90's NFL. With very little practice, I tried a full game of footy, playing as Hobart. While the Tasmanian city does not have a presence in the major Australian Football League, their team must certainly be better than how I played them. My opposition, Carlton, was historically dominant but have only won one title since this game was released. I knew what to do, so that did not seem to be the problem. I was, however, doing it at two in the morning when all I wanted to do was sleep. This being 2 on a Sunday morning in America, this was going on as actual AFL games were happening. Near the end of the half, I finally got past my opposition’s 50-meter line. At the half we were down 80-0, and the footy gods were FedEx-ing the wooden spoon to Audubon, New Jersey, whitewashed. No miracle happened, but none was needed. In the end my Hobart squad made Greater West Sydney look like Geelong, but it was fun to jump around (they call it a mark) and lose almost every jump ball. 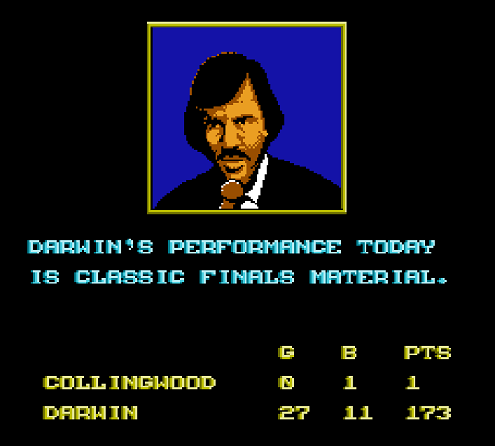 Carlton scored 168 points, which is rare but not impossible in footy. My big fat goose egg, however, is a pretty rare accomplishment. I bet some of the birds that surround the Melbourne Cricket Ground could score at least a behind. The next morning, on the other side of tired, I practiced a little on the hand to hand mode, and felt like going for a personal best of something, ANYTHING!!! I did not go anywhere near the center of the oval, but my Hobart side started to play something resembling defense, and so we were only down 70-0. Also, although this is no excuse: Carlton did use the wind to their advantage during the second quarter. I finally did get win some tipoffs, and almost threatened to get past the 50-meter ring again. My Hobart squad managed a respectable 152-0 drubbing, which I guess is not bad for someone playing his second game. But finally, a day or so later, my luck changed for the better. All of a sudden, I learned how to win the kickoff, and actually won one or two. So there I was, with the ball, beyond the 50 meter mark. I got up to the goal line, and kicked the ball through!!! It only went through the center-right and right posts, but I was so proud of my behind that I can finally retire from this bloody game a champion. I need to point out that I adore the idea of Americans braving aussie rules football. I have a sort of pride in how unashamedly moronic it is (someone give them armor, for gods sake). Where can you get this game? Best version of Aussie rules ever on a video game. The new game out this year is way to complex. that dog. Reunion Show Recap, Video and Setlist! The Dark Knight Rises Round Up! Review: Men in Black III : Black Harder. Let's Look at the Monster Fighters Lego! Jetpack Joyride Gains a Dog (and Wins my Heart)! Review: Hot Toys Sucker Punch Babydoll! Look Who's Next! Hot Toys Teases Black Widow! Musings on NBC's Upcoming Show "Revolution"